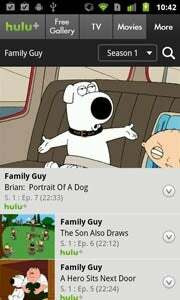 Hulu is finally giving Android users an easy way to watch videos from the service on their smartphones. The Hulu Plus app ($8 per month subscription fee, U.S.-only) is now available in the Android Market and allows users to watch around 16,000 episodes of current and classic TV shows. The Hulu Plus Android app won't work with all Android phones: it's only available for Nexus One, Nexus S, HTC Inspire 4G, Motorola Droid II, Motorola Droid X, and the Motorola Atrix. Support for additional devices should be announced throughout the year. Hulu's director of product management, Rob Wong, said in a blog post: "We know that a lot of people want that content on their Android smartphones. We've been working hard to make that a reality, and today, we have begun our early rollout of the Hulu Plus application on Android smartphones. We expect to add to the number of Android smartphones and will be making additional device announcements throughout the year." So far, initial app reviews are in favor of Hulu's implementation of the service for Android users, but keep in mind the mobile selection is around half of what Hulu offers on the Web. If you are unsure whether Hulu has the TV shows you like, the company offers new subscribers one free week to try the service. Hulu is the second major video streaming service to release an Android app (following months of availability on the rival iOS platform), after Netflix, which last month launched its Android app. In a similar fashion, Netflix's Android service is limited only to a bunch of phones, four from HTC, two from Motorola, One from LG and one from Samsung (Nexus S).